Google has revealed the most popular searches for people around the world looking for universities. This ranking of online searches is very different from the traditional map of the global powerhouses of higher education. There is a strong interest in online courses, rather than traditional campus-based universities, says Google. And there are five Indian institutions in the top 20 of most searched-for universities. The top search worldwide is for the University of Phoenix, a US-based, for-profit university, with many online courses and a sometimes controversial record on recruitment. The University of Phoenix, founded in the 1970s, comes ahead of famous US academic institutions such as Harvard, Stanford and Columbia. In second place in this league table of university searches is the Massachusetts Institute of Technology - last week ranked as the world's best university and also an institution with a strong record for pioneering online courses. The top European university is not some ancient institution, but the UK's distance learning pioneer, the Open University. It has been developing online courses, including for the US, and is in third place in the Google most-searched rankings. University College London and the London School of Economics are both ahead of Oxford and Cambridge among UK universities. The University of Calicut, in Kerala, India, is fourth in this ranking of online searches. And Anna University in Chennai is the second Indian university in the top 10. Liberty University, an evangelical Christian university based in Virginia in the US, with many online students, appears in the top 20. 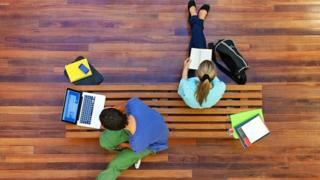 The internet has become a key marketplace for universities to reach potential students, says Google's analysis. It is also increasingly the medium for delivering courses, including massive open online courses or "Moocs". In 2013, searches for online universities overtook traditional universities. Taking the UK higher education system as an example, Google's search patterns show a globalised and fast-changing market. Among searches worldwide for UK universities, 40% are from outside the UK. The biggest international regions for searching for UK universities are Asia Pacific and western Europe. This has helped to put five UK universities in the top 20 - but Google's report on search data shows the volatility and pace of change. In 2011, the most searched-for universities in the UK, apart from the Open University, were conventional campus-based institutions, headed by Oxford and Cambridge. By 2014, all of these UK campus universities had been overtaken by Coursera, the US-based provider of online courses. Other Mooc providers, such as edX and FutureLearn, had also emerged as bigger than many traditional UK universities. "The growth that they've experienced has been phenomenal," says the Google analysis. "Higher education institutions must decide whether to embrace and adapt or risk getting left behind." The Khan Academy, which has been providing online teaching material since 2006, has more search activity than Cambridge University, teaching since the 13th Century. Universities are acutely aware of the importance of their online presence, says Ronald Ehrenberg, director of Cornell University's Higher Education Research Institute in New York. The internet is the "primary way" that universities market themselves to potential students and to alumni, says Prof Ehrenberg. "We update our web page multiple times a week to broadcast all the news that is going on at the university and all of the achievements, including research, of our faculty and students, and showcase all the visitors to the university. "But this is only the tip of the iceberg in the way that the internet has changed how we behave. "Many institutions are heavily into online instruction as a way of expanding enrolments... many institutions are moving to expand revenues by growing professional masters programmes in a wide range of areas." Nick Hillman, director of the Higher Education Policy Institute in London, says the impact of Moocs has been "over-sold". But he says university websites have an important role in recruiting, particularly for overseas students. The Google data suggests that academics, accustomed to university terms, will also need to pay attention to search terms. "The internet is playing an ever increasing role in the decision making. Students are online searching and consuming content in all forms when they are deciding whether or not to go to university and deciding which universities to apply for," said Harry Walker, education industry head at Google.